Nosler’s running a special sale right now on over-run brass and bullets. There are some very good deals on rifle brass, including .223 Remington brass at $29.95/100 — that’s 46% off Nosler’s regular price. 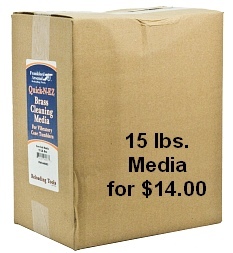 6.5×55 Swede brass is also deeply discounted to $31.95 — down from $51.00 per 50-count box. Other types of brass on sale are: 30-378 ($54.95), 340 Weatherby ($34.95), and .338 Lapua Magnum ($54.95 for 25 cases). That’s an attractive price for quality .338 LM brass. Nosler’s summer savings aren’t limited to brass supplies. Nosler is offering low-cost, 250-count bulk packs of Custom Competition Grade bullets. The 69gr, .224-cal bullets are just $46.95, marked down from $61.00. And the 190gr, .308-cal bullets are just $69.95 for 250 projectiles (reduced from $91.00). Log on to Nosler.com to check out this over-stock savings. Share the post "Good Deals on Nosler “Custom Competition” Brass and Bullets"
We reported last week that both Sinclair Int’l and Brownells have commenced selling loaded ammunition. Both vendors now carry a full selection of rimfire and centerfire ammo, for pistols, rifles, and shotguns. This is the first time in Brownells’ 70-year history that it is selling ammunition. To promote the new ammo sales program, Brownells is offering a 5% discount on your entire order, if it includes ammunition. That’s right — if you purchase some ammo, you get 5% off EVERYTHING in your order (which can include tools, gun parts, supplies, you name it). But wait, there’s more — for all orders over $199.00 that contain ammunition, Brownells’ will also kick in FREE SHIPPING. To get the 5% off and Free Shipping on $199.00+ orders, use Code CXL on check-out. 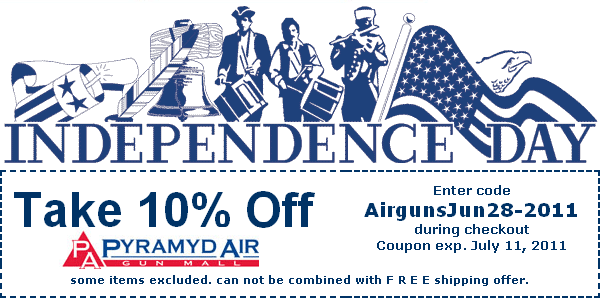 To make this perfectly clear, so long as you purchase at least one box of ammo, you get 5% off your whole order. Can’t complain about that! But be advised — this is a limited time offer — Brownells is reserving the right to terminate these special offers after next week. So act now if you want to save 5% on your entire Brownells order. Share the post "Brownell’s Offering 5% Off Entire Order for Ammo Buyers"
‘Tis the season for Air Rifles at Camp Perry. 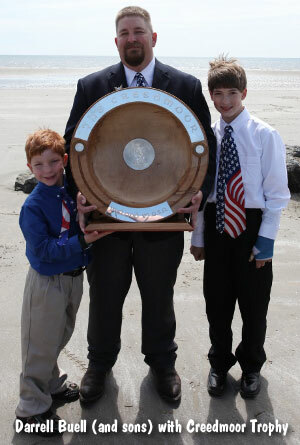 The NRA National Junior Air Gun Championship at Camp Perry just concluded yesterday, June 25th, 2011. 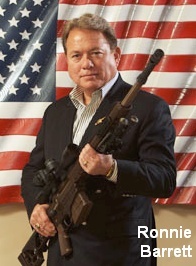 Photos from the event are displayed in the slide show below (courtesy the NRA Blog). 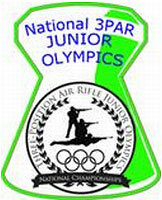 Today, June 26th, the National Junior Olympic 3-Position Air Rifle (3PAR) Championships commences. The event will run for six days, finishing July 1st. The Junior Olympic Tournament will be held at the CMP Marksmanship Center (North) at Camp Perry. The CMP will provide special LIVE coverage for the 3PAR Junior Olympic event. Live target images and results will be available on the CMP website at http://clubs.odcmp.com/cgi-bin/report_matchResult.cgi?matchID=7132. The Civilian Marksmanship Program (CMP) now has an official Facebook Page. There you’ll find news, match reports, photos, plus the latest updates in CMP Programs and Sales. You can also link to events if you have your own personal Facebook page. CLICK HERE to visit the CMP’s new Facebook Page. 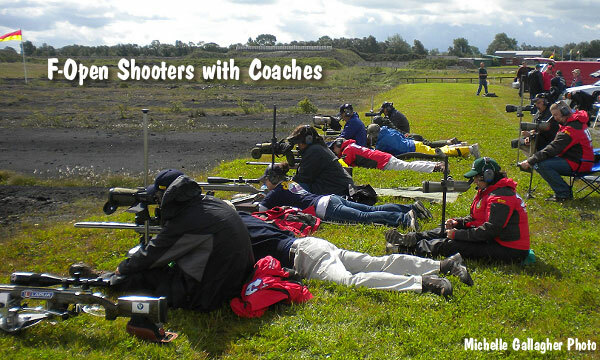 Share the post "CMP News: Air Rifle Championships and Facebook Launch"
We know many of our readers run their own businesses. 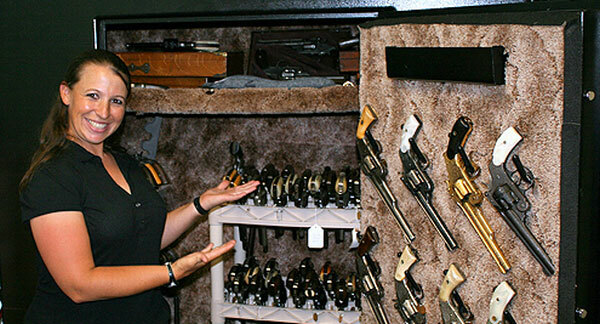 Here’s important news for small business owners, gunsmiths, and independent contractors. 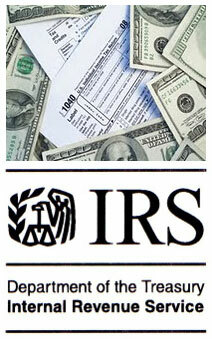 Effective July 1, 2011, the IRS has raised the mileage deduction for business-related travel from $0.51 to $0.555. The IRS made this unusual midyear change in response to the sharp rise in gas prices, which now exceed $4.00 per gallon. So, for business trips conducted between 7/1/2011 and 12/31/2011, you should deduct 55.5 cents per mile traveled. To qualify for this deduction, you need to keep detailed records of each trip (date, destination, purpose, mileage) and you must claim the mileage on your Schedule ‘C’ at tax time. After initially saying it would not change the mileage deduction in mid-year, the IRS relented, announcing new rates on June 23, 2011, which are effective July 1st. The deductible business travel rate will rise to 55.5 cents a mile. That’s an increase of 4.5 cents from the 51 cent rate currently in effect. Also going up by 4.5 cents between July 1 and Dec. 31 of this year will be the mileage deduction for medical or moving expenses which were increased from 19 cents to 23.5 cents per mile. 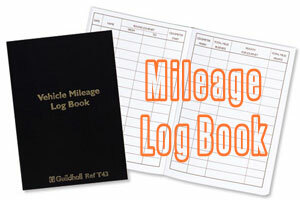 TAX TIP: If you deduct business-related mileage we suggest you keep a little log-book in your vehicle. Write down the date of your trip and the starting mileage. When you reach your destination, write down the ending mileage. If it is a round-trip journey, you can log the end mileage when you return — but be sure to record your destination and a few notes to explain the purpose of the trip. There are also expense reporting Apps for smartphones that allow you to record mileage. However, be sure to back up your digital deduction logs so that they don’t get lost if your phone goes haywire or if the battery dies. Share the post "IRS Increases Mileage Deduction to 55.5 Cents per Mile"
Graf’s is running a cool special right now on CCI and Federal primers. If you purchase any two (2) cases of primers listed below, Graf’s will pay the $25 Hazardous Materials Fee. One case of primers contains five, 1000-count boxes of primers. The discounted sale prices, plus the free Hazmat Fee, makes this a very good deal — provided you need a whole bunch of primers. Qualifying primer types are: CCI500, CCIBR4, CCIM34, FDGM155M, FD215, FDGM200M, FDGM205M. 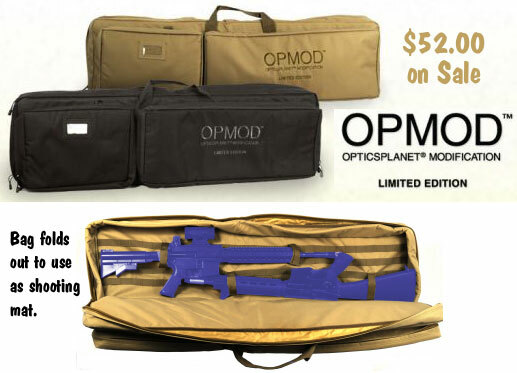 Note the Fed 205M (match) primers are on sale for $149.99 per case, which works out to $30 per thousand. 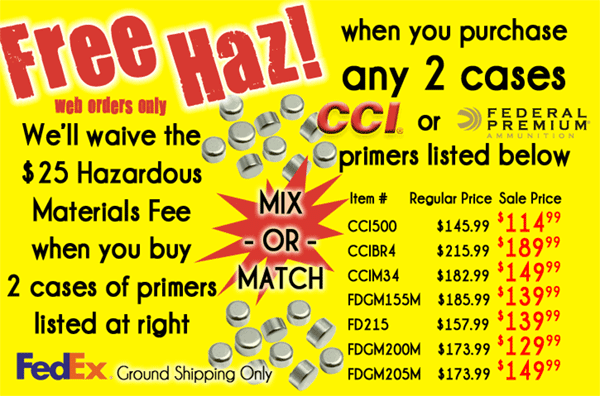 Kick in the free Hazmat and that’s very competitive pricing. To take advantage of this deal, you may want to bundle an order with one of your shooting buddies — or perhaps organize a group buy with other members of your shooting club. And here’s the good news — that FREE Hazmat will cover other items (such as powder) up to a total weight of 50 lbs. of hazardous materials. For example, let’s say your two cases of primers weighs 20 pounds (boxed) — then you’ll have 30 pounds of free hazmat “coverage” left. Note — These prices only apply to internet purchases. The offer is limited to ONE free Hazmat fee per order. All ordered items must be in stock. To qualify, orders must be able to ship via FedEx Ground. Share the post "Free Hazmat with 2-Case Primer Order at Grafs.com"
From Pat & Matt — We’d like to update you on a few new items that have been or will be added to our line up of tools. We also have one item that is available while supplies last. We’ll start there. 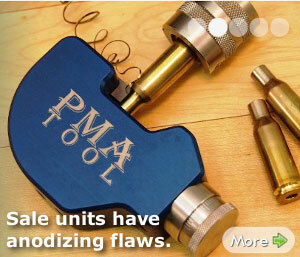 We have six (yep, only 6) blemished Model A Neck Turning Tools available while they last. These tools are completely functional, but boy are they ugly. For one reason or another the anodizing just didn’t take on these six tools. We wouldn’t feel right charging full price for them, so we’ve discounted them to $79.95. They can be found on our PMA home page under SPECIALs (lower left) or in the “New” section (lower center). Our new pre-set neck turning tool (tentatively called the Model B Tool) will be available in a matter of weeks. These neck turners will be available with your choice of cutter angle (30, 35 or 40), your choice of stainless steel mandrel (22, 6mm, 6.5mm, 7mm or 30cal) and preset to your choice of cut thickness. We will guarantee the thickness to .001”. The price of this tool is $45.95 complete (mandrel installed), all you have to do is adjust the mandrel location. This tool is a great, economical choice for shooters who like to have 2, 3, or even 4 tools set to different depths to get the thickness down to size. It’s also a great choice for any one who wants uniform case necks for a factory or non-tight neck custom chamber. This neck turning tool comes pre-set, but can be adjusted if need be — it’s just not nearly as easy to adjust as our Model A. We have an update on our carbide neck turning mandrel situation. They will be available before summer’s end in our standard sizes (22, 6mm, 6.5mm, 7mm and 30cal) and will be priced at $45.95. If you would like, you can pre-order carbide mandrels by emailing us (support@pmatool.com) and letting us know which size you need. We will place you on the list and you will receive an email as soon as they are available. Last, but not least, we are expanding our stainless steel mandrel offerings to include 17, 20 and 338 calibers as standard options. Share the post "Update from PMA Tools — Special Deals, New Products"
Not much to say here — the photo and the price ($25.00) pretty much tell the story. Here’s a chance to pick up a nice range bag for a low, low price. Big enough for a couple full-size pistols, ammo, and muffs, this bag features zippered pockets on both ends and slot pockets on the sides for magazines and other thin items. 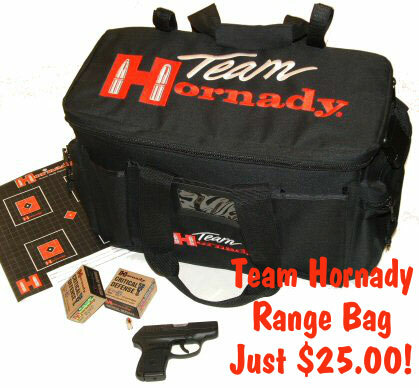 We don’t know why Hornady slashed the price of the Team Hornady range bag from $59.99 to a mere $25.00. That’s a 58% reduction — what we’d call a serious discount. The bag is roomy and functional, and we think it’s pretty handsome — so long as you’re not logo-phobic. This range bag, item 9919, is sold directly through Hornady’s website. Visit Hornady’s online store soon to grab one before the price goes back up. Click photo (above) to go to the Hornady order page. Share the post "Team Hornady Range Bag Now 58% Off — Just $25.00"
Bruno Shooters Supply is selling Federal 205M Small Rifle Match primers for just $27.95 per 1000-ct box. That’s a very attractive price — just a couple years ago, these primers were very hard to find, and were selling for nearly fifty bucks per box. Now Bruno’s has 205Ms available for immediate delivery at prices that are $10.00 – $12.00 per box cheaper than some other major vendors. If you prefer the 205Ms for your .223 Rems, PPCs, BRs and 6.5×47 Lapuas, here’s a chance to grab a good supply without breaking the bank. Note, however, that the $27.95/box price does NOT include shipping and hazmat fee. 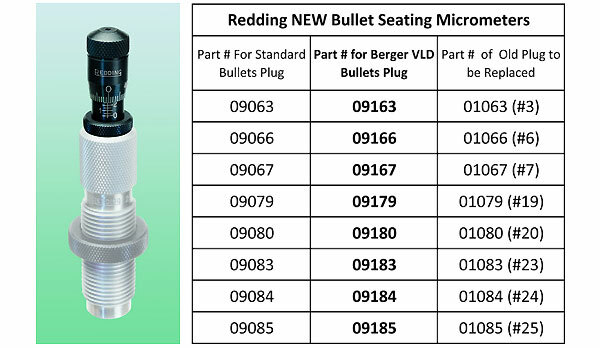 To order these primers, call Amy Bruno at 1-800-455-0350, or (623) 587-7641, or log on to www.Brunoshooters.com. 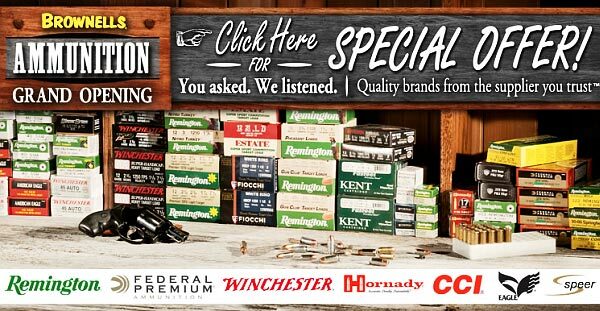 Share the post "Federal 205M (Match) Small Rifle Primers at Bruno’s — $28/K"
FNH USA is kicking off the summer with an attractive “free ammo” promotion, designed to spur sales of FNH rifles and pistols. (FNH USA is the sales and marketing arm of FN Herstal, S.A., Belgium.) Here’s the deal: if you purchase selected models of FN rifles, pistols and carbines between June 27 and August 31, 2011, FNH USA will reimburse you up to $150.00 for ammunition purchased at the same time from the same dealer. Here’s how the FNH “free ammo” deal works. If you buy a new FN FNAR rifle, an FN SCAR™ 16S carbine or an FN FS2000 carbine, you’ll be reimbursed for up to $100.00 in free ammo. 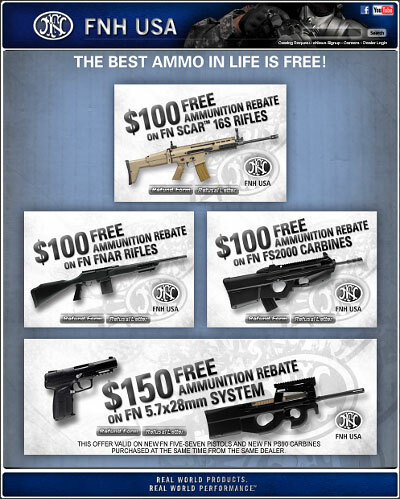 If you purchase BOTH a new FN PS90 carbine AND a new FN Five-seveN® pistol and you’ll get up to $150.00 in free ammo. If this deal seems attractive, don’t delay — the offer expires August 31, 2011. Visit FNH’s dealer locator to find an FNH USA retail dealer near you and CLICK HERE to learn more about the Free Ammo offer and to download official rebate forms. Share the post "FNH USA Offers Up to $150.00 in FREE Ammo to FNH Gun Buyers"
For the next few days, Harbor Freight is selling an 11-drawer rolling tool cabinet for just $169.99 with CODE 71638506. This U.S. General Roller Cabinet measures 17″ D x 27″ W x 52″ H (without handles), and can hold up to 350 pounds of tools and gear. The finish is a black powder-coat, and the lockable drawers have non-slip liners. The only assembly required is attaching the handles to the drawers. NOTE: You should pick this up at a Harbor Freight store, as the Roller Cabinet weighs 151 lbs. (crated) and has an $89.95 additional freight charge! Once the sale expires on 6/26/2011, you can still order the U.S. General 11-drawer roller cabinet for $199.99. We know this is a thin-walled, entry-level unit. It certainly does NOT have the quality of a Snap-On Roll Cart tool chest, but you could pay nearly $1400.00 for a Snap-On rolling cabinet. Even a Craftsman mobile tool chest (of similar capacity) could easily set you back $700.00 or more. For some folks, the Harbor Freight unit will suffice pretty well until they can upgrade. And the money one saves can be used for tools to put in those many drawers. The video below does a good job explaining the cabinet’s features — and it shows the inside capacity of most of the drawers and compartments. Share the post "Roller Tool Cabinet is Harbor Freight’s ‘Deal of the Week’"
The SlickGuns.com website, a resource for firearms sales and special deals, has a regularly-updated page dedicated to discount coupons. On SlickGuns.com’ Coupon Page you’ll find the latest money-saving coupons for major vendors including: Gander Mountain, MidwayUSA, and Sportsmans Guide. Check the Coupon Page regularly, as the Coupon Codes are typically replaced every 2-4 weeks. shipping on purchases of $99 or more. 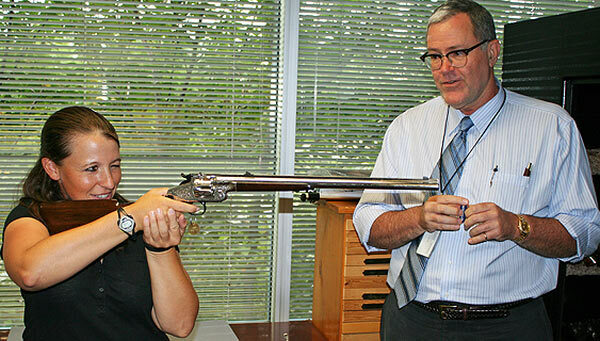 Share the post "Major Vendor Discount Coupons at Slickguns.com"
On June 20th, SGT Sherri Gallagher of the U.S. Army Marksmanship Unit stopped by NRA Headquarters (in Fairfax, Virginia) for a tour of the facilities. 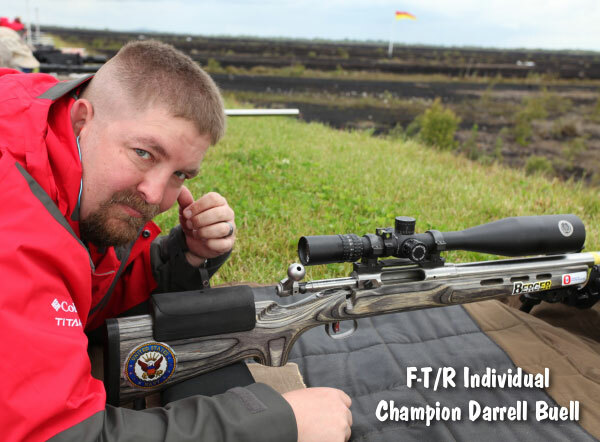 A highly accomplished shooter, Sherri is the reigning National High Power Rifle Champion as well as winner of the 2009 Long Range High Power Championship at Camp Perry. 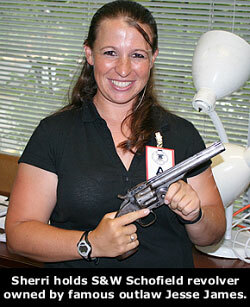 Sherri holds Smith & Wesson .320 Caliber, 18″ barrel Revolving Rifle. Share the post "Sherri Gallagher Visits National Firearms Museum in Virginia"
Just how accurate can a modern 6 PPC benchrest rifle be? 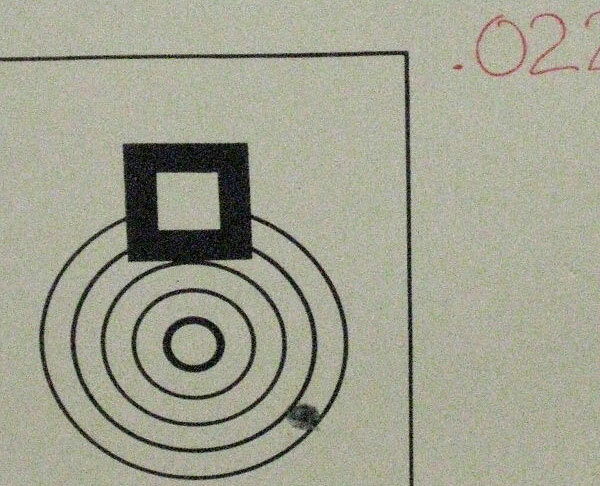 Would you believe five shots in 0.022″? That’s the size of the group shot by Rich Graham this past weekend in Visalia, CA. 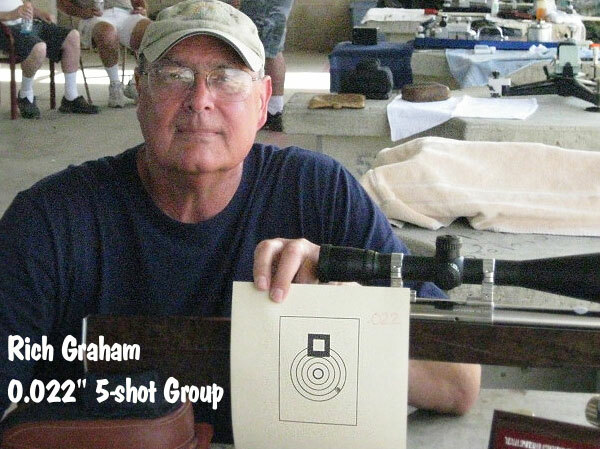 Rich was shooting his 6 PPC 10.5-lb LV bag gun in the Unlimited Class. Below is a photo of Rich with his target — yes there are five shots in that one hole (as confirmed by moving backers used in the match). This five-shot group could be a potential new NBRSA 100-yard record, if the 0.022″ measurement is confirmed. The current 5-100 NBRSA Unlimited record is 0.049″ shot by Gary Ocock in 2009. 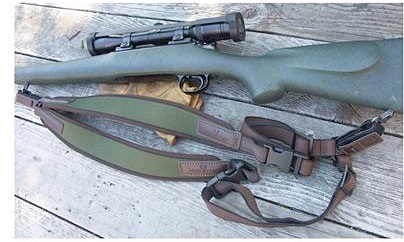 For reference, the 5-100 NBRSA Heavy Varmint Record is 0.027″ by Ralph Landon in 1975. 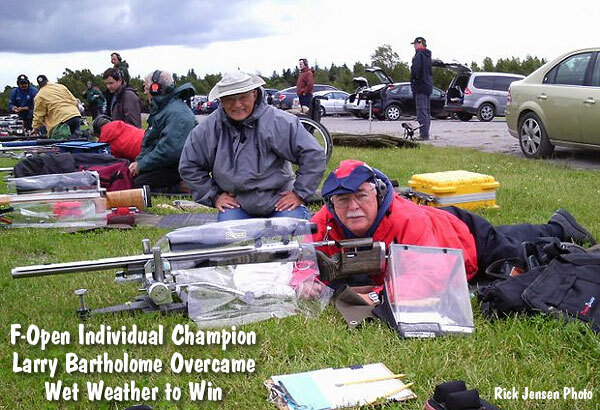 Though Rich shot his small group in the Unlimited Class, his rifle is a typical 10.5-lb, short-range benchrest bag gun. Smithed by Gary Ocock, the rifle features a BAT action (we believe), Bruno Edge stock, Krieger Barrel, and March scope. The load was 27.8 grains of Hodgdon H322 with 65gr Flatbase bullets made on a Nielson die, in Lapua brass. 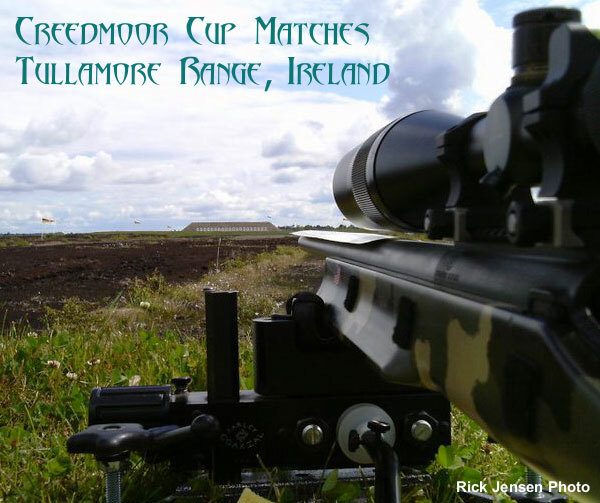 We are told that Rich shot this potential world record with ammo pre-loaded before the match. We think Rich’s target will definitely come in under the current 0.049″ Unlimited Class record. Using our On-Target plotting software, we measured Rich’s group at 0.029″. However, keep in mind that we were working from a photo, and the camera lens can distort dimensions a bit. Accordingly, the original 0.022″ measurement by the match scorers is probably more reliable, but this helps illustrate how small Rich’s group really is. Photos courtesy DanL. Story tip by Boyd Allen. 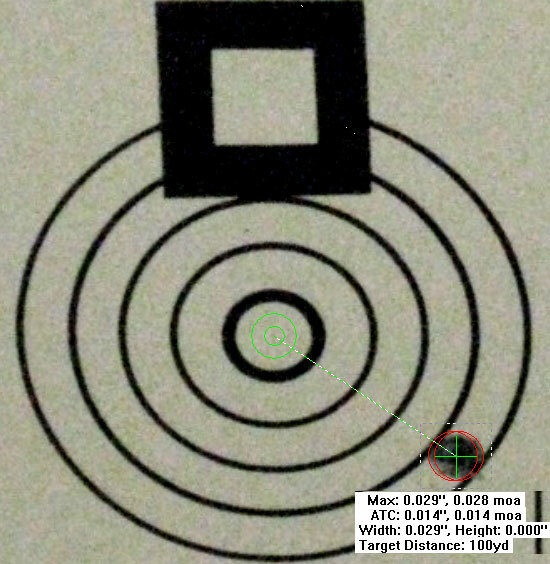 Share the post "0.022″ Group — Possible New Unlimited 100-Yard NBRSA Record"
The faster a benchrester can send his rounds down-range, the better his chances to complete his 5- or 10-shot group in the same conditions before a major change. Shooting fast is NOT always the best strategy, but many world records have been set using this technique. Even if you’re a “picker”, there are times when you’ll benefit from shooting fast. With current benchrest hardware you still have to manually load each cartridge, even if you have a drop-port action or if you have an ejector that kicks out the fired case. To speed up the loading process, benchrest shooters employ elevated loading blocks that place the cartridges inches away from the loading port. That speeds things up, but you still have to manually pluck your cartridge and stuff it in the action… until now. Get ready for a major new technology that could change the benchrest game. Carlos Gonzales, a benchrest shooter (and Professor of Engineering) from Argentina, has perfected a horizontal, external “floating” magazine that can reliably feed PPC cartridges as fast as you can work the bolt. This is interesting because, in 2009, this Editor discussed an attached horizontal feeding tray with three different action makers. All of them dismissed the idea as impractical or too radical. Well guys, it looks like Carlos pulled it off. 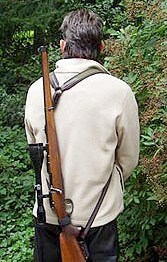 The Gonzales “magazine” is actually an open-ended, covered metal tray situated on the left side of the action (but it does not touch the gun — it is supported by the rest). This feeds into the left-side loading port. The cases are gravity-fed, but the shooter has positive control over feeding. A cable with a push-button control runs from the magazine down to the rear foot of the pedestal rest. You just push the button to drop one cartridge from the magazine. We don’t know exactly how the cartridge is released in the magazine itself, but in the video below you can see how the push-button works. You push the button as soon as a spent cartridge ejects (watch Carlos’s left hand in the video above). It is a clever set-up, and as you can see, the magazine system works very, very fast. The video shows Carlos running five cartridges through his action in just 9 seconds (time marker 00:31 – 00:40). That’s fast! On a repeat viewing focus on Carlos’s left hand to see how he works the push-button cartridge dispensing control. Now the question remains… will the official benchrest “powers that be” allow this device, or will they, fearing change, say it is forbidden under current rules. We would like to see the Gonzales magazine ruled legal for both domestic (American) and International competition. But, we acknowledge that Carlos’s invention could raise the cost of competition. The Gonzales mag would be one more “go-fast” item that serious benchresters would have to purchase. Share the post "Radical New External Magazine Loader for Benchrest Rifles"